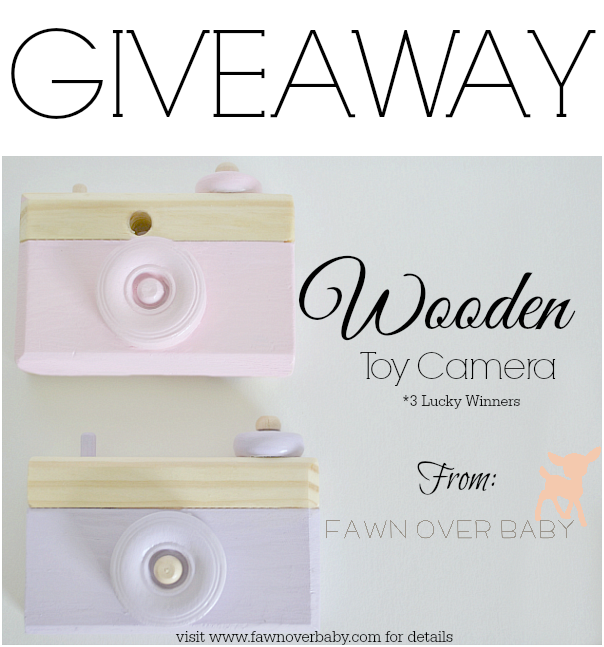 Fawn Over Baby: DIY Wooden Toy Camera + Giveaway! 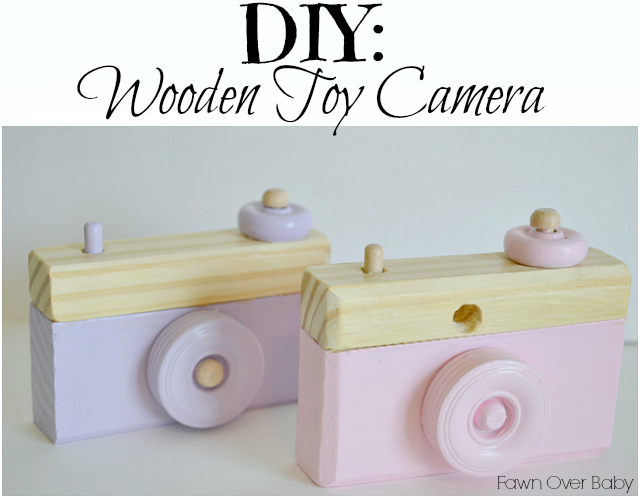 DIY Wooden Toy Camera + Giveaway! I found these planks of bass wood at Michaels already cut pretty close to size, however they were just a tad too big for my little one's hands to hang on to, so we used the measurements from the Nap Time DIY for the perfect fit. 2. You will then want to mark your drill sites for your shutter button, mode dial and lens. 3. I enlisted my husband for this portion of the tutorial. 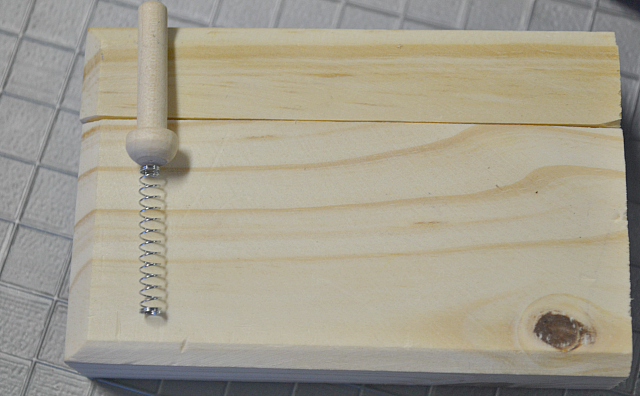 We used a 1/4 drill bit to drill holes for the shutter button, mode dial and lens. When drilling holes for your shutter button, be sure not to drill too far down, as you want the tip of your peg to poke out of the top of your camera. Hopefully the photo below will give you a better idea of what to aim for when assembling your shutter button. 4. 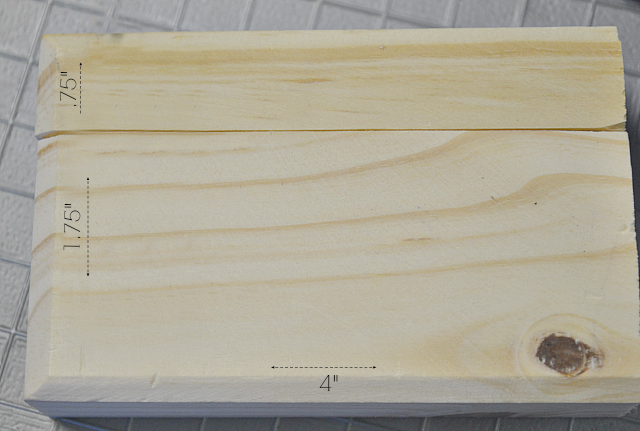 Cut your wood plank lengthwise creating a .75" top and 1.75" bottom to your camera. 5. 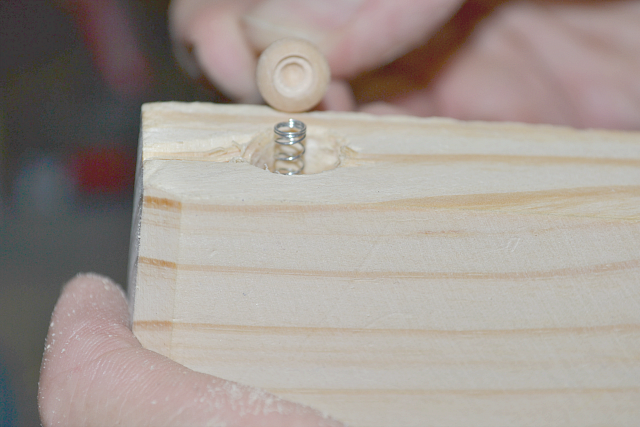 Use a 3/8 drill bit to create a wider hole on the bottom portion of the camera to accommodate your spring and peg combo. 6. This is optional. 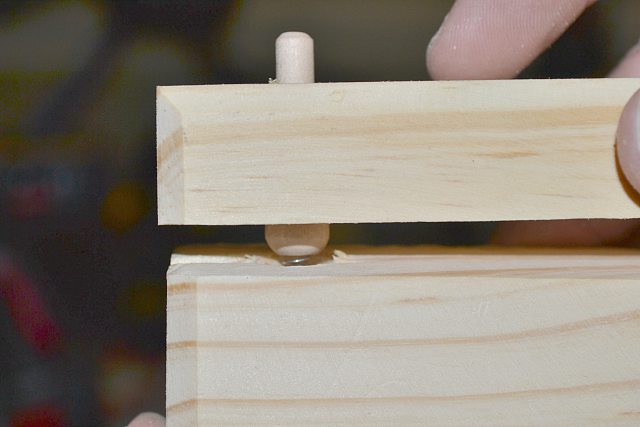 My husband decided to drill a little indention in the peg cap for the spring to rest in. I eventually glued them together. 7. Next, assemble and add your mode dial and lens in their marked areas. 8. When you press your mode dial and lens pegs into their holes, make sure not to press too far, leaving a little room for both the mode dial and lens wheel to turn. 9. 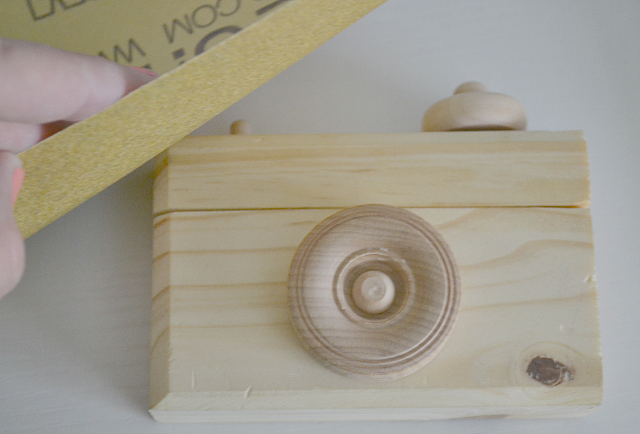 If you choose to leave camera a natural finish, then here is where you will use wood glue to attach all the pieces in place. 10. I then lightly sanded the rough edges creating a smooth surface and added a thin layer of non -toxic Mod Podge over entire camera sealing it and creating a glossy smooth surface. THAT'S IT!!! 10. I would first paint the pieces that you want to brighten up. Then let dry. 11. Apply a layer of non toxic sealer over all pieces. 12. 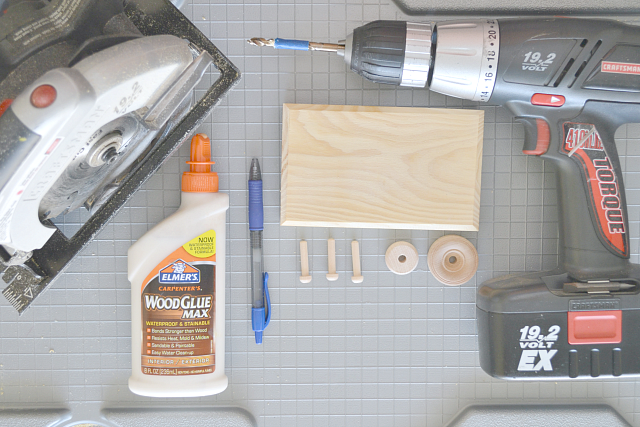 Assemble your pieces then apply small dots of wood glue to attach all the pieces to wood planks. Be sure not to use a lot of glue as you do not want it to leak through the seams. If it does, I would wipe away as much as you can, sand your seam then re-apply sealer. 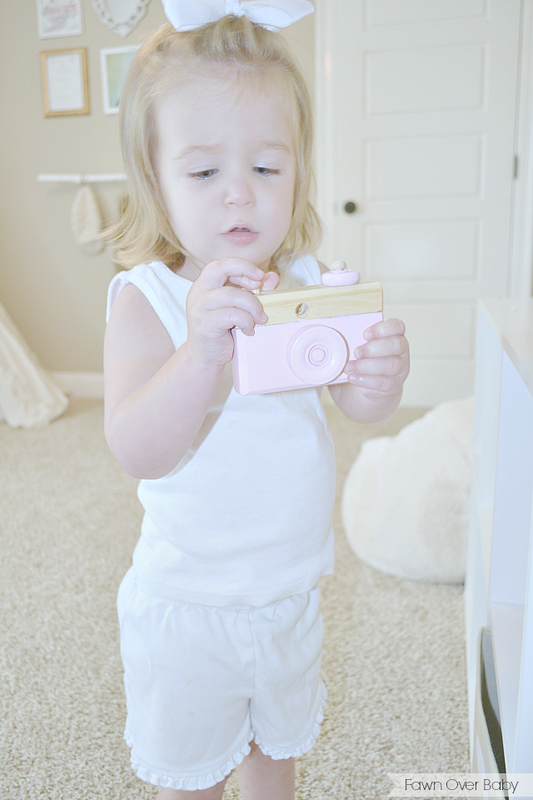 Here are a few photos of Kenzie perfecting her camera skills. This was such a fun and quick toy to put together. I bought several pieces of wood just in case we had a little "uh oh" and needed backup. We actually ended up loving our first attempt and now have a lot of extra materials on hand. With that said, I have enough to make three more, soooooo….how about a fun giveaway to make things even more exciting?! 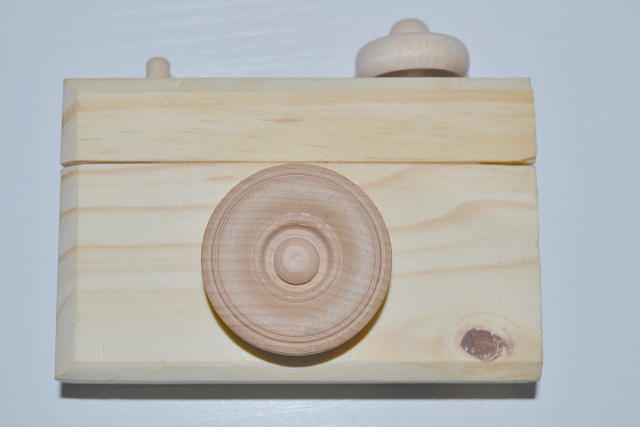 Help bring out the mini photographer in your little by presenting them with their very own Wooden Toy Camera with Moveable Parts! 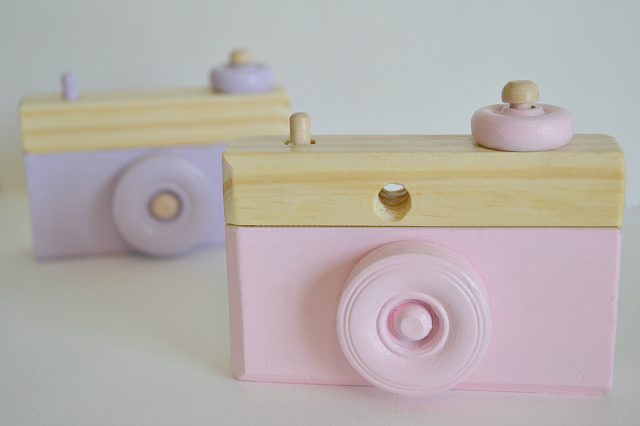 THREE LUCKY READERS will receive a wooden camera painted color of choice from the color options posted below! Enter using the Rafflecopter form Below with Options for Extra Entries ! Be sure to leave comment before moving on to extra entries. Each entry will be verified. WINNERS will be randomly chosen and announced Friday, July 11th! I thought the same thing! I'm so glad I stumbled upon an easy tutorial! 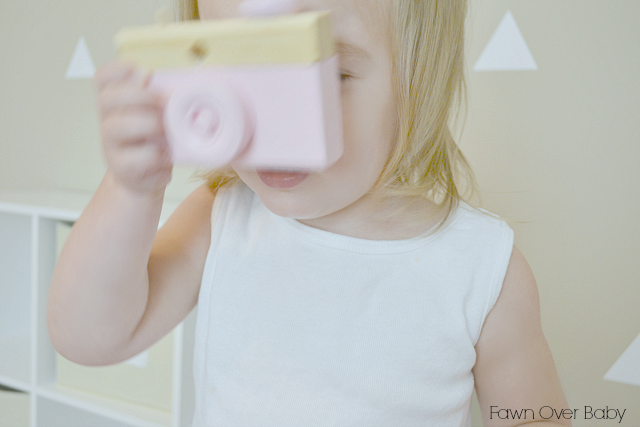 What a great alternative to the pricey wooden camera toys I've seen! Love this DIY. Thank you! It was so a fun project! Wow I never thought to try to DIY something like this. Great idea! Would love in mint. Thank you! Mint is a Wonderful Choice! Yellow is such a fun and happy color, which reminds me of my happy baby boy! He also loves and claps to "If you're happy and you know it..." so color number 4 would definitely be my choice! I love how fun and thorough this tutorial is, thanks for sharing! Bower and Groover wanna wiiiinnnnn!! So stinkin cute! Super cute ! Would be a great prop. Thank You Tristen! It would make the perfect prop for a little's photo session! That would such a fun color! Thanks for entering Anne! Such a cute idea! I have looked for a toy camera for my daughter but there is not a lot out there that isn't crazy expensive or has bad reviews! Thank you Chrissy! These are really cute and a perfect fit for my little. I know you will love it! i am loving the mint and lavender colors, but i think i would have to pick #10 for our sweet baby girl! we don't have very many girlie colored toys so this would be the perfect addition for her. i absolutely love this little tutorial and absolutely adore the simplicity of the toy! Oh gosh I adore these!! I might just have a sweet little future photographer on the way soon... I'd like to pick pink #10... but with how it goes in my family... better pick adorable #4 just to be safe (boy or girl!!) Love my boys, but I need some more pink in my home!! Thanks for the sweet giveaway! Thank you Melanie! #4 is a cute gender neutral color! Good Choice! Thank you Kristen! Good Luck! That is a great idea Acsa! Thanks for entering! Good Luck! I pinned this and I am having a hard time pasting the URL. I hope it went through. Yay! Let me know how it goes Kenzie! 7 would be so cute for a boy! Good Choice Debbie! Number 6 - that sweet soft mint is just perfect for any sweet baby! Thank you! I love mint! I don't think I could ever get tired of it! Good Choice Kaitlin! My twin two year olds would love one of these in #6 or #7! Number 3 - love the orange! I would actually love to see that color! Fun choice Janet! wow!! I'm so impressed with his project!! What a cute idea. Wooden toys are my favorite! This is adorable! I love that the button is a spring, super cute! That bright pink (#1) would be perfect for my little lady! Sassy Bow Co.- Discount Code Surprise!! !